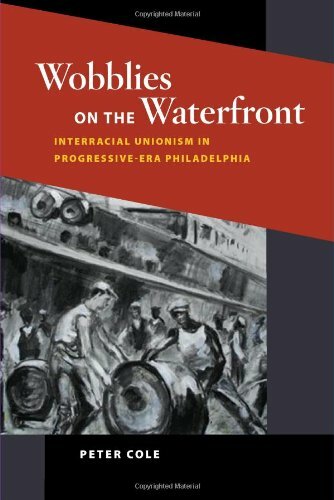 Peter Cole, Wobblies on the Waterfront: Interracial Unionism in Progressive- Era Philadelphia, University of Illinois Press: Urbana and Chicago:July 2007, 227 pages, , hardbound, cost $40. Peter Cole’s Wobblies on the Waterfront: Interracial Unionism in Progressive- Era Philadelphia challenges the idea that the IWW’s vision of interracial unionism was little more than revolutionary slogan and tokenism. Instead, Cole describes how the IWW overcame the barriers of racism on the waterfront in Philadelphia, United States. As Peter Cole —tells, Philadelphia area longshoremen and sailors known as Local 8 were the only major example of successful interracial unionism until the Thirties and arguably until later. Cole describes Philadelphia’s long history of ethnic barriers and racism, particularly the bitter street fights between Irish immigrant longshoreman and African- American longshoremen. He describes in detail as well the constant corruption of Philadelphia’s government. Cole also presents how previous Philadelphia longshoremen’s organizations failed because of racism. The context Cole provides makes the story of the success of Local 8 that much more improbable and satisfying. In 1913, 3500 longshoremen of various backgrounds including African- Americans, Irish-Americans, and recent Lithuanian and Polish immigrants went out on strike together and formed Local 8. As Cole points out, the strikers sought out the IWW, not vice versa. The predominantly African-American longshoremen (more than 50 per cent) chose the IWW over the more prominent and established International Longshoremen’s Association because of the IWW’s egalitarianism and the fact that one of the Philadelphia IWW’s leaders was himself an African-American, that leader being Benjamin Fletcher. (Fletcher, incidentally, was the recent subject of another Peter Cole book put out by C.H. Kerr this year.) That the ILA was segregated and undemocratic did not help it gain favor amongst Philadelphia longshoremen. The IWW and Local 8 grew in Philadelphia because of its success with on the job actions and its bold antiracist stance. It was normal practice for instance to get a job with scabs or non-union longshoremen, then refuse to work until the scabs had joined or been fired. That in a nutshell shows how much power Local 8 had. Local 8 maintained racial harmony in numerous ways. One was through a rotating leadership system, which specified that the top two leadership positions of the union were filled by one African- American and one white and that those positions were rotated year to year. Another way to make sure that every group was empowered was to make sure that each group was represented in every committee and amongst the delegates. The ethnic groups that made up Local 8 understood that their livelihoods depended on interracial solidarity. While economics bound them together, shortly after the founding of Local 8 members became bound to each other socially and interacted with and formed strong relationships with each other outside of their work. What all of this added up to was that very simply, at the apex of their power, Local 8 controlled the Delaware River. That Local 8 did this without ever signing a contract still would shock any modern union person. Local 8 was even stable and powerful enough to ride out the famous government repression of the IWW that began in 1917 with the United States’ entry into the First World War. Cole argues that the US government’s repression of the IWW in Philadelphia was not because the government actually believed that the IWW was aiding the Germans but because the government wanted an excuse to destroy the IWW. It is almost funny how disingenuous the government was being at this time while many Philadelphia-based Wobbly seamen were being killed by German U-Boats and many Philadelphia Wobblies were either not against the war or even for it, such as jailed leader Walter Nef. Even as most of Local 8’s leaders, including Ben Fletcher went to jail for several years, Local 8 still held its own, showing that the IWW in Philadelphia was deeper than just their wellknown leaders sitting in jail. Cole explains in detail the effect that the rise of the Communists had on Local 8 and on the IWW as a whole. Cole explains that at the worst possible moment in Local 8’s history, the Communists probably did the most to destroy Local 8 when they accused Local 8 of loading supplies that would be used against the Red Army fighting the Russian Civil War. It was a bogus charge and one that Cole shows to be improbable at best, but one that got Local 8 de-chartered the moment it could least afford it, as it was being attacked by the AFL’s powerful International Longshoremen’s Association, the government and local capitalists. By the early Twenties, several members of the GEB were Communists and were following the dictates of the Moscow and American Communists. The Communists believed that the proper way to bring about a revolutionary labor movement was to bore from within, not by creating a separate radical labor organization, thus the Communists believed in crushing the IWW. That the Communist influenced- GEB pulled the charter of the Local 8 and thus prevented Benjamin Fletcher (an anti-Communist) from being elected to the GEB, does not speak well of Communist foresight. At this moment the government and Communist-supported ILA managed to finally regain a foothold in Philadelphia thus destroying the longshoremen’s democratic unionism and later their interracial unionism. One of Cole’s regrets is that he never got to speak with a member of Local 8. However, Cole uncovered an impressive range of sources from interviews with Philadelphia longshoremen who were members of the IWW and later the ILA, military intelligence files and the like. By using the writings of A. Phillip Randolph and W.E.B. DuBois on the subject of Local 8, Cole puts into context how extraordinary Local 8 was and how nationally prominent they were. If and when Benjamin Fletcher becomes a figure seen in school text books (as he has become in several African-American history textbooks), it will probably be in large part thanks to Cole’s scholarship. Using Philadelphia as an example, Cole argues very convincingly that the government repression argument for the decline of the IWW is not exactly true, but instead it was a combination, at least in Philadelphia, of government repression, the government, and Communist- backed International Longshoremen’s Association, and increased racial tension, all coming together during the birth of the Communist movement in the United States. If that sounds complex, that is because it is complex, at least a lot more complex and credible than some other major historians’ arguments on the IWW. Because of the book’s focus on race, Wobblies on the Waterfront will be relevant in the US for many years to come, as race and racism remain prominent problems. Because it is well written, because it argues an alternative view of the IWW and because it revolves around many still pertinent issues, Cole’s books is one of the few “must-read” books on the IWW and labor history in general to come out recently.